Get a year membership to Daytrotter, courtesy of the Ridges! Remember when I wrote about Ohio band The Ridges? Well, they’ve been busy since I reviewed their EP in May. They hit up Daytrotter in the fall, and have now released the gorgeous session. The band is all about atmosphere (the EP was recorded in an insane asylum, remember), so it’s no surprise that they met up with Daytrotter in an old, dusty barn. 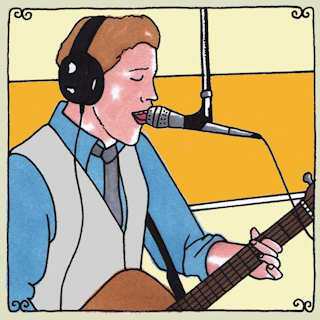 The band is now giving away a free year-long membership to Daytrotter, and all they’re asking is a tweet or share. Just post this on your Facebook, or retweet this by noon (EST) tomorrow for a chance to win. “[Victor] Rasgaitis, percussionist/vocalist Johnny Barton and cellist/vocalist Talor Smith – along with an assortment of auxiliary players and characters – make the kind of Americana music that falls off the bone, but it’s hidden with turn of the century and Dust Bowl-era themes that make it understood that there’s bone there still.” Read more from the session here. This entry was posted in the ridges and tagged daytrotter, the ridges on January 5, 2012 by kredcarroll. Like Bon Iver and his backwoods lodgings, the Ridges’ recording venue has become part of their story. As with the whispered tunes of For Emma, Forever Ago, the five songs on the band’s self-titled album are imbued with the location’s spirit. Rather than hunker down in a cabin, however, the Ohio folk-rockers chose a creepier spot: an abandoned insane asylum. Although most of the music I write about comes from merry olde England or elsewhere across the pond, I have to give a nod to the trio from Athens. For one, I’m inclined to appreciate anyone who comes from my birth state; more importantly, their debut EP The Ridges shows promising confidence and self-awareness. I never would have expected a band to reap such positive results from a Victorian mental institution, but they incorporate its haunting aesthetic in a remarkably natural way. Although the album is not without its joyful moments (standout track “War Bonds” closes in an exuberant fervor), there is a dark romanticism that undergirds the entire project. If Fleet Foxes had a shady underbelly (and a female vocalist), they might create the harmonies on opener “The Insomniac’s Song”, for example. Other tracks almost recall the baroque-folk of bands like Horse Feathers, or even the acoustic pop of someone like Fanfarlo, but with a slightly ominous twist. Besides lending both its name and a decidedly haunting vibe to the album, the echoey space of the Athens asylum captures the band’s expansive sound. You can practically feel the old floorboards creak below the orchestra, which is comprised of as many as six musicians in addition to the original trio. Interwoven lines of unique instruments (from accordion to double bass) create a rich background for tales of death, love, and lingering pasts. The Ohio band’s self-titled album has a clear direction; it’s cohesive without being monotonous. The spirit of the asylum permeates every track, but the Ridges have made it their own. This entry was posted in the ridges and tagged asylum, athens, ohio, the ridges on May 31, 2011 by kredcarroll.